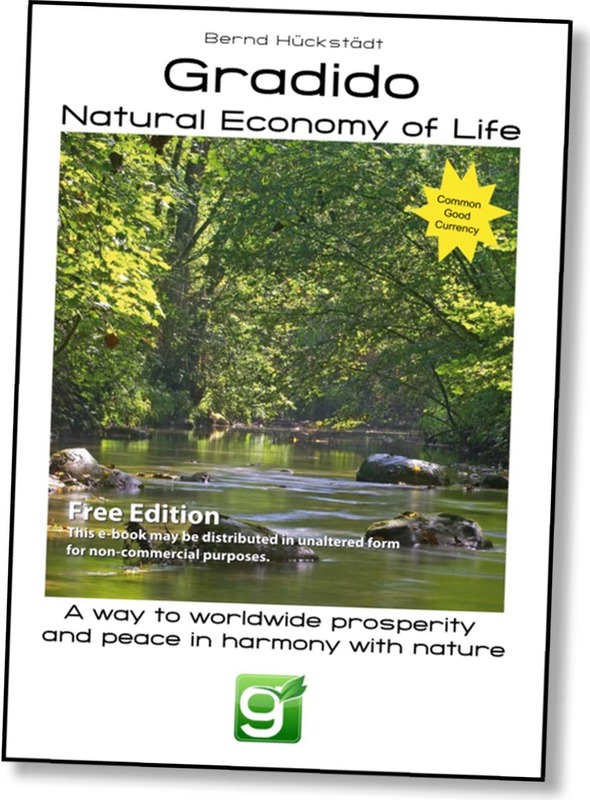 Gradido – Natural Economy of Life is a prescription for and a description of a currency to produce Nirvana, based on the author’s observations and understanding of nature. 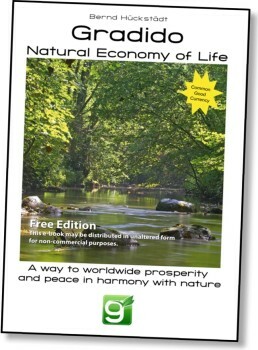 My comments analyse the free e-Book version which, while limited, contains the essence of the author’s message. My take is that the author is ‘onto it’ in regards to some currency matters but fails in both his strategy and his proposed solution. I have an interest in alternative currencies. I consider understanding the true nature of money to be the second most important question of life* and have spent decades (the bulk of my business life) trading and dealing in every form of currency I could find – from the early Green Dollars in New Zealand through every system of commercial barter that popped its head above the parapet! Author of ‘Gradido – Natural Economy of Life‘ is Bernd Hückstädt, from Germany. He is clearly an independent thinker and has put together what is on the surface a well-reasoned case for his currency design. His detailed breakdown of chapters into subheadings, also helps ENORMOUSLY to grasp the essence of his message, for the subheadings are frequent (one or even two per page); they are descriptive and best of all they are included in the Contents, making for an excellent big-picture overview of his book when you read something like I do – the Contents first [that gives me the overview], then the Last Chapter [this is the wrap-up and usually contains the all-important ‘juicy bits’], and then drilling down into Chapters (or in this case subheadings) that interest you or need further clarification. In this post, rather than trying to detail his message in my own words, I list his excellent Contents, then pick out a few memorable quotes and comment on them. I explain the prime problem with his take (by considering money to be a commodity, when it is not and can never be) and I then finish by highlighting the flaw that I see in his premise, the error that any system (such as a financial system) can or could ever alter the nature of the fallen human being, which of course is a core plank of the Christian world-view. I find his currency concepts interesting (Chapter 2 contains the core vision where humans and nature are living together in harmony. His currency model is a form of Socialism with aspects of Social Credit) but he will be ultimately unable to achieve the goals he wishes to achieve, especially when he ignores the WIIFM factor. His prescription requires conceptual and philosophical agreement on the use of generated funds and thus will only ever be of highly limited implementation – people will certainly not all agree with his ideas. It takes a lot to write a book. It’s a risk putting your thoughts out there and Bernd has done it – congratulations and well done to him! The zero-sum dogma is contrary to nature. Living nature visible to us is always positive. The zero-sum dogma results in exploitation, both of nature and our fellowmen. The fundamental assumption of scarcity leads to a theory of economics opposed to nature, whose supporters do not shrink from making virtually all goods of daily life artificially scarce. A system of creating money from debt harms everybody and benefits nobody. Interest and compound interest further aggravate the problem. But even interest-free monetary systems have the harmful impact described. Well-meaning alternative monetary systems, such as barter clubs and exchanges, LETS systems and suchlike are also included in this category. Regional currencies, which are tied to the national currency, cannot be considered as solutions for this very reason. Do you remember where money comes from in the old system? Correct – from nothing! Assets and debts are created from »nothing«. Figures are generated in a computer according to internationally recognised rules. The old rules follow zero-sum principles and are designed in such a way that their impact harms everybody and benefits nobody. The gradido – the »living money« – is created from life itself. Through the existence of every person 3,000 gradidos are created every month without debts being created. The new rules, according to which the numbers are generated in a computer, follow the plus-sum principle and serve the threefold good – the good of the individual, the good of the community and the good of the big scheme of things. The cycle of growth and decay makes the gradido a self-regulating system. The money supply is stable and can’t be manipulated. This is all wrong. It is a fallacy of the first order. It is totally impossible because true money is not a commodity with a “supply” just the same as the quantity of ANY measurement can never “supplied” or “stable”! Money can never be what the classical economics textbooks teach us (a unit of account [measurement], a store of value and a medium of exchange all at the same time). This is a logical fallacy of the first order. A litre of water or a pound of butter are just that – measurements OF something . . . so a Dollar or a Euro (or in this case a Gradido) must be a measurement OF something. It is of course . . . DEBT! That’s what true money only ever can be – simply a record of a half completed transaction – NOTHING MORE! Sure we use a piece of paper or digital equivalents to represent the debt but at its core a Gradido, Dollar, Euro or whatever simply represents debt, specifically as I constantly put it, “True money is only ever a record of a half-completed transaction**“. This understanding has profound consequences but to think otherwise (where money is viewed as a commodity) simply plays right into the hand of darkness. I share more about this in other places, more recently: Importance of Trading, The Perfect Traders’ Currency, and the [non-mainstream but] Christian take on Usury-based money Usury-based money is accursed . . . plus my early posts about Club Credits: The race to zero, The nature of money and Smarter than Barter ~ Better than a Bank! Free donation is a crucial part of our economic system. While it used to be important to make big profits, the intention of free donations is to benefit yourself and others as much as possible with as little expense and work as possible. With this it isn’t so important to get something in return because the benefit and joy come back severalfold to the person who freely donated. While this is an ideal, it a lovely one and one in which matches a ‘New World Order’ of the biblical (and New Age and other) kind. This is also the natural economy of the Samoan community prior to the arrival of Western Churchianity and Capitalism. Again though this is a description of a philosophical ideal. Our mind is an extremely precise instrument when it comes to recognising the finest differences. However, we recognise commonalities better with our hearts. The prime concern I have with Gradido, is the entire concept of what I termed (in partial jest) the prescription for Nirvana – the perfect world. Strong among the New Age community, the concept and search for Nirvana (a perfect world) involves a global consciousness change. Nothing wrong with that in my book . . . let’s all work to make the world a better place by all means, but there is a problem to be overcome – self, self-interest, greed, pride or whatever one wants to label it. This is easily understood with the marketing acronym WIIFM (What’s In It For Me?). As a strategist, we look for ways of achieving our goals, and in the case of Bernd, how could we achieve HIS goals. No currency, no allocation of credit in equal measure will ever alter the fallen nature of man. The vast majority of people always seek to benefit from life’s opportunities and any system, from the Bitcoin algorithm to government to social benefit/control systems to Bernd’s proposed solution will be viewed as an opportunity to benefit by the vast majority of the world’s population. It is very rare that humans transcend the natural urge to look after self first. You do not have to agree with everything you have read here. The gradido is a research project and the content of this book contains the present state of research. I do not think that it has ‘legs’. It could easily capture the imagination of some people already in the same space, which is only natural (for birds of a feather flock together) but it will not achieve the goals of the designer, simply because it fails to deal with the underlying [in ‘Christianese speak’] fallen nature of humankind. Furthermore I find that the combining of role a currency with a social, environmental, commercial or spiritual purpose is common but self-defeating***. Gradido is no different so in a nutshell sadly, it may be well meaning but is doomed. “So . . . Mr Knowitall . . . how would YOU do it?” you may ask! Understand that money is first and foremost only ever a record of a half-completed transaction – NOT a commodity that can and should be issued, controlled or bought and sold. So . . . that is an exit to gold, Bitcoin et al and all debt-based Legal Tender Currencies! Understand that it is traders (not bankers, ‘market forces****’ or governments) who are the ones who determine the value of any money (and they do this at the point of sale); it is traders who are in the best position to determine what money is required, when it is required and the terms of issuance/credit etc and it is the traders who will determine the ethical issues of the use of that money (not philosophers, marketers, politicians, priests or currency geeks). Give the people a tool (currency) that fits in with the basic criteria I mention in my post The Perfect Traders’ Currency which will solve their problems and achieve their objectives. In another time, place and format feel free to attempt to change the world, hopefully making it a better place. ** Christchurch economist Ron McKenzie was the first to use this phrase – he’s onto it! *** As I explain in the post about the evils of usury, the nature of a currency CAN be blessed or accursed according to scripture (and thus the form of money is not always morally neutral) but even a currency built on sustainable, interest free mutual credit in accordance with scriptural guidelines can only ever be passive in these areas. It can be USED by those with agendas to facilitate them but it can never actually facilitate that agenda. They are two different, distinct components often confused.